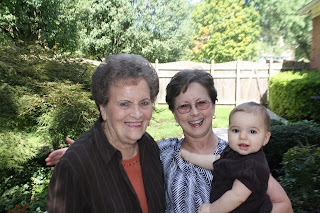 We recently visited my cousin Michelle for Mamaw's 85th birthday luncheon. Anabelle has a cousin, Claire, who is two months younger than she is. We had a blast! Here are a couple of pictures with Mamaw, Aunt Kathy, and Uncle Charles.